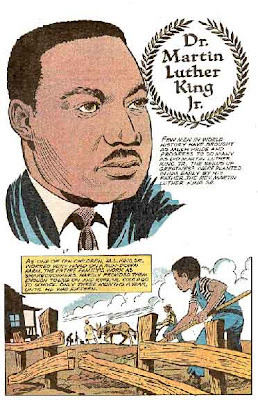 A colleague of mine found this MLK comic online from Golden Legacy's Illustrated History Magazine series. I thought it would be nice to share with you. Fifteen other titles about African Americans are also available as is a 512 page hardcover edition including all 16 titles. We hope to get our hands on them so we can review them for you. These comics have not been read or reviewed by our staff, but thought you might want to know about them with MLK Day next week and African American month right around the corner.